Prunus emarginata (Douglas ex Hook.) D. Dietr. This small deciduous species of cherry tree is native to British Columbia. It is found from BC south to California and east to Montana, Wyoming and Arizona. Shrub or small tree, 2-15 m tall, sometimes thicket-forming, smooth to densely hairy throughout; bark reddish-brown or grey, with horizontal lenticels. Alternate, deciduous, elliptic to egg-shaped or lanceolate, 3-8 cm long, finely round-toothed, rounded or blunt to sometimes sharp-pointed at the tip, wedge-shaped to pointed at the base, densely hairy (at least below) to smooth; leaf stalks 5-12 mm long, usually lacking small glands at the top. Inflorescences short, rounded to flat-topped clusters, at the ends of short spur-shoots, of 3 to 10 stalked flowers; corollas white, saucer-shaped, the petals 5, egg-shaped, 5-7 mm long, often hairy on the lower surface; calyces smooth to coarse-hairy, 5-lobed, the oblong lobes about 2 mm long; ovaries superior; stamens about 20. Fleshy drupes with a large ellipsoid stone (cherries), egg- to globe-shaped, 8-12 mm long, bright red to purple; seeds 1. 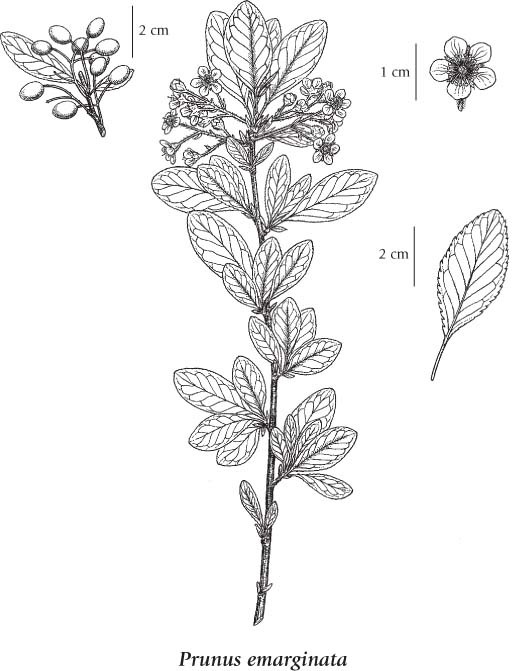 The more typical tree-like plants from coastal areas have been given the varietal name mollis (Dougl.) Brew. Moist open forests, thickets, rocky slopes and streambanks in the lowland, steppe and montane zones; common in southwestern BC, disjunct in WC BC, infrequent in S BC east of the Coast-Cascade Mountains; S to CA and E to MT, WY and AZ.